Welcome to your brochure for the 2019 Gathering! We would like to provide you with an overview of some of the events and happenings for the 2019 Gathering. There will be workshops offered before the start of classes on Friday, April 26, 2019. The teachers set the cost of their workshops and payment is expected as part of your registration. However, some teachers will accept sign-ups at the time of the workshop. There is an interesting variety of projects, so consider this as a great way to start the weekend. Please note that classes may have different start/stop times, different length of class times, and that one teacher is offering two baskets for weaving on Saturday. 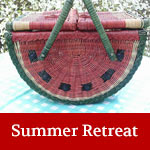 A few classes have different class numbers; the teacher is offering the same basket with different accessories. Please consider the level of experience, the measurements of the baskets, and any options when you are choosing your class. We suggest that you measure out your basket selection on a table for a better understanding of the size of the basket. 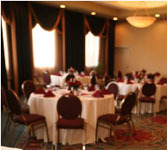 Dinner meals are included in the Friday and Saturday registration packages. You have the option to buy lunch on Saturday. Please be aware that no outside food can be ordered to be brought into hotel (such as pizza delivery or catering), and the hotel does not offer lunch in their restaurant. It has been said before, the planning of a Gathering is a “labor of love” and enjoyed by us all because we are committed to NBG and its members. If you have any questions, ideas or comments, please contact us at nbggathering19@gmail.com. The Double Tree Hotel by Hilton Hotel Hartford-Bradley Airport rate for overnight accommodations for the NBG Gathering is $109 per night, plus room tax. This rate includes a continental buffet. If you wish to register for the overnight stay at the Doubletree, you may contact them online or call them at 1-860-627-5171. Be sure to mention the code CDTNBG for the special rate. Their dining room is open for lunch and dinner. The deadline for registering and receiving the special NBG rate is March 26, 2019. The meal options have been chosen based on monetary consideration, information received from past Gathering surveys, and nourishment. You are more than welcome to make your own meal arrangements. You may purchase meal options for other members of your party. The cost reflects meal price, Connecticut sales tax (6.35%) and the required 21% gratuity. As in the past, the meals are substantial, quality offerings, and the service is excellent. Friday and Saturday dinners are included in the package prices for those days. You may also buy Saturday lunch. When completing the meal portion of the registration, please indicate the meals that you will be purchasing and meals that you are purchasing for guests. 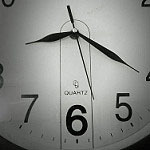 If you are not attending dinner(s) that are part of your weekend pack- age, please let us know. This will give us a more accurate count for planning and financial purposes. Registration through November 30, 2018, is open to all members of NBG whose membership is current. Membership also needs to be renewed by January 1, 2019. Classes are assigned according to their codes. Please list you choices in order of preferences. 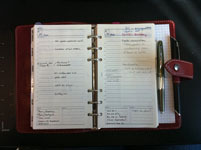 Listing multiple choices for each day helps insure your initial placement. Registrations may be mailed or completed online at your convenience, but they need to be received by October 15, 2018 to be treated as first-day registration. Classes will be filled by random selection from registrations received by October 15. Registrations received after October 15 will be assigned space on a first come, first served basis. First-time NBG event attendees or returning nonmembers may register after December 1, 2018. Friday and Saturday packages include dinner. The registration form includes an option for purchasing lunch on Saturday, as well as options for purchasing meals for others in your party. When processing online registration, please complete the registration form and submit it, then choose the payment option, complete the payment information and submit it. There are two steps to submitting registration and payment online. We try to monitor submissions, but if you do not receive a payment confirmation or hear from the coordinators confirming your registration in a couple of days, contact us at nbggathering19@gmail.com. Every effort will be made to give you the class(es) of your choice but there is no guarantee of placement in requested classes. If desired classes are not available, you may choose to be placed on a waiting list or you may cancel. You will receive an e-mail notification when you submit your registration, when class assignment(s) are finalized by December 1, 2018, and when remaining payment for registration packages and teachers’ material fees are due by February 1, 2019. Payment of teachers’ material fees and remaining registration fees are due by February 1, 2019; otherwise you will forfeit your place in class(es) and your $50 deposit. There are no refunds of registration payment or material fees after March 26, 2019. The attendee must make arrangements with another member or attendee (or, as a last resort, the event coordinators) to get the kit(s) from the teacher(s). If you want a printed notification of class assignments, please send a #10 SASE with your printed registration. You will receive your class assignment sheet by email before printed notifications are sent. You may register online or download a registration form here. If you have any questions or comments, please contact Beverly Shafner or Marsha Leavitt at nbggathering19@gmail.com. NBG is committed to increasing membership. Therefore, we offer nonmember specials as a way of introducing basket weaving and NBG. If you have a friend or you are someone, who is not an NBG member, this offer is for you. A nonmember can sign up for the one-time only special of attending a class at any NBG weaving event and pay no registration fee—pay only the teacher’s materials fee. Nonmembers can attend NBG events but they pay a higher registration fee than members. For the 2019 Gathering it’s $25 more to the cost of any weekend registration package. Nonmembers may register for open classes after December 1, 2019. Youth who attend weaving events with an NBG member also waive the registration fee and pay only the teacher’s materials fee. Anyone who is new to NBG or is attending the Gathering for the first time will be paired up with another “more experienced” member. This Buddy Plan will provide new attendees with a partner who will introduce them to other members, provide information about the Guild and details of the Gathering, and, most importantly, the Buddy can be a “friend.” If you have any questions please contact Tina Pearsall at tinapea@optonline.net. Save postage! 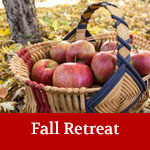 Register and pay the $50 nonrefundable deposit online, or you may register by sending your form and check to Beverly Shafner, 258 Crawford St., Northborough, MA 01532 by October 15, 2018 for first-day registration. Class assignments will be sent by December 1, 2018. Make hotel reservations by March 26, 2019, to be eligible for NBG room rate special at Double Tree in Windsor Locks. No refunds after March 26, 2019. Registration is open until April 1, 2019. Debra Rolfe dauby52@gmail.com is coordinating the NBG Exhibits during the 2019 Gathering. We encourage all members to display their work in the Exhibit Area. One entry per member. Drop off of baskets begins Friday at noon and is available anytime the area is open. 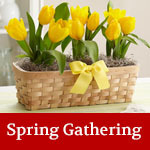 Baskets should be picked up on Saturday between 4 to 5 pm. Members may vote on Saturday from 8 am to 4 pm. Ballots will be included in the Welcome Packet at the registration area. No ballots will be available in the Exhibit room. Winners will be announced at dinner on Saturday night, during the annual meeting. More information on categories, awards, and entering your baskets will be in future newsletters. Mary Williams maryedwilliams@yahoo.com is the Coordinator for this special event. Teachers and attendees are invited to donate a basket or basket-related item for the raffle. A fun-filled, robust, highly anticipated drawing of the winners is part of the social hour on Saturday. 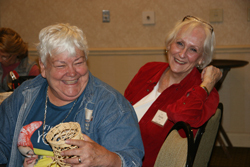 Basket-themed decorations appearing in the lobby and on the tables during meals in Meadowview are contributed by members who weave or create these pieces. Kate Carroll tenlittlelines@yahoo.com is coordinating this year. After a wonderful day of weaving on Saturday, join us for a social hour in the lobby area outside the New England Ballroom. Enjoy wine, sodas, and light appetizers. 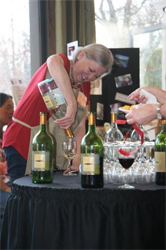 This event provides an opportunity to socialize, and as you socialize participate in the Raffle drawings. This event is a great way to end Saturday during the Gathering weekend. Gathering teachers are invited to participate as vendors. 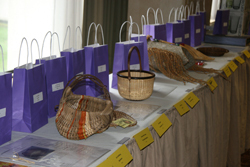 Nonbusiness NBG members may purchase a table for $25 and vend basketry-related items. Contact Cathy Parrish fishquilt4@gmail.com with any questions or to reserve a table. This year’s member display is being coordinated by Barbara Mitchell barb5126@msn.com. We are inviting members to bring baskets they have collected from different regions of the United States, such as Northeast, Mid-Atlantic, South, Midwest, and Plain States. You can email Barbara information about your basket (please put “NBG display” in the subject line) or include it on card when you drop off basket. 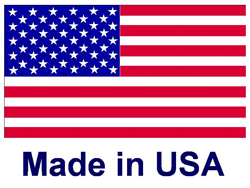 Please include the type of basket, materials, what state or region it came from, and the year it was made. 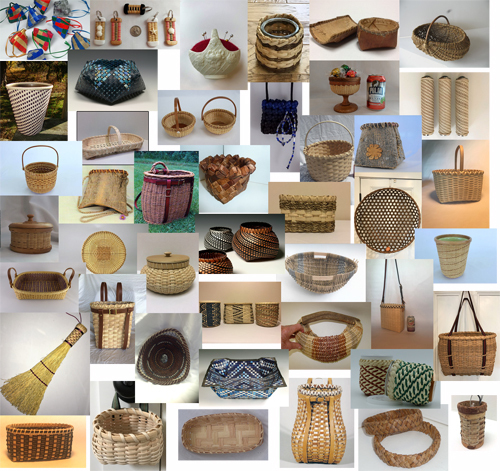 These baskets may be ones you have bought, received, or woven. “Many hands make light work” is definitely how the Gathering weekend functions. In addition to all the people listed in this brochure who are coordinating tasks and projects, we need additional volunteers during the weekend. There will be a sign-up list of tasks posted in the lobby beginning on Friday. Please look over the list and volunteer. Event coordinators may also be contacting you to assist with an activity. We all thank you—this is another important aspect of a great, fun, and organized Gathering. We always need early-arrival attendees to assist teachers and welcome other attendees. Representatives from the Creative Arts Division of the Big E will have a table at Marketplace and would enjoy talking with you about NBG. 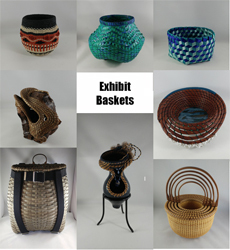 Stop by to learn about entering baskets for 2019, the NBG award for youth or general category, or to find out about volunteering to demonstrate basket weaving—these are the many ways that NBG is involved with the Big E. Also see a display of basket entries from 2018 and talk to some of those members who may be present at the Gathering. NBG has scholarships to award yearly. The application process begins in January 2019. The Bill Pope Scholarship is available to an NBG member to attend the Gathering. Now is the time to look at the scholarships and the criteria, and to make your plans. More information will be in the upcoming newsletters. The scholarships are awarded during the annual meeting on Saturday night of the Gathering. 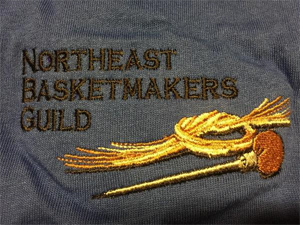 Information on scholarships is available at northeastbasketmakers.org/scholarships/ or by contacting, Mary Jo Rushlow, Scholarship Coordinator saltbox.crafters@cox.net. This year we are selling 3/4 sleeve Tee Shirts with our logo. Choose from Jade or Royal. See the details here.